Swing into the New Year with the Mile High Jazz Band at "Cool Jazz in January," a big-band event with guest vocalist June Joplin substituting for Cindee LeVal, at Comma Coffee on Tuesday, January 12, 2016, 7:30 to 9:00 p.m. Comma Coffee, 312 S. Carson Street, is across the street from the state legislature building in Carson City. General admission is $5 at the door; free for age 18 and under. The 19-member Mile High Jazz Band performs music in the spirit of Duke Ellington, Count Basie, Woody Herman, and more contemporary jazz styles from their repertoire of more than 100 charts. June Joplin will sing "La vie en rose," "Sway," and "Till You Come Back to Me" with the band. For information about "Cool Jazz in January" and other live music at Comma Coffee, call June Joplin at 775-883-2662. 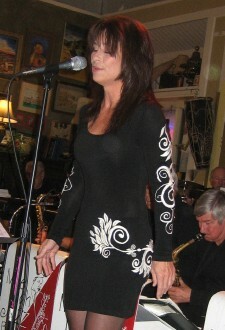 For information about the Mile High Jazz Band, call 775-883-4154 or see MileHighJazz.com. 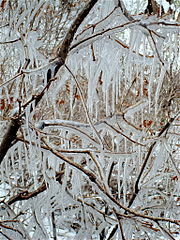 Photo credit: Icicles Mesa Verde National Park, by Greg Tally, from Wikipedia. On Saturday, January 23, 2016, the Mile High Jazz Band will present a jazz workshop for middle school and high school students. The workshop will be at Carson Middle School from 9:00 a.m. to 1:30 p.m. This event is not open to the public, but middle school and high school age musicians from Carson City may participate. There is no cost to participate. Tristan Selzler is the founder of the Reno Jazz Syndicate. This multitalented musician plays jazz piano, trombone, and guitar, sings, and composes. He has taught music at the Davidson Academy of Nevada and Western Nevada College. Clinicians for the various sessions include Jef Derderian (improvisation session), Nat Kline (scales and chords session), and Tyler Cravines (rhythm session). Assisting them in instruction will be members of the Mile High Jazz Band and other fine musicians. Jef Derderian is currently working on his masters degree in jazz and improvisational music at the University of Nevada, Reno, where he has performed in various ensembles from jazz band and jazz combo to the scholarship brass quintet and orchestra. He also holds a teaching assistantship at the university, as well as helping to coordinate the annual Reno Jazz Festival. Having received his undergraduate degree from UNR, he has studied with Larry Engstrom, Paul Lenz, Peter Epstein, and Adam Benjamin. He has shared the stage with musicians such as Dave Douglas, Ingrid Jensen, and Avishai Cohen. Tyler Cravines, drums, is the newest member of the workshop faculty. He studied music at the University of Nevada, Reno. His group, Free Try, focuses on group improvisation and spontaneous composition. He and the other members of the group are well versed in many styles of music, and the players' eclectic and unique voices come together to form a well balanced, unified sound. For information, contact David Bugli at 775-883-4154. This event is funded in part by a grant from the Nevada Arts Council. The workshop is being done in conjunction with the Jazz Extravaganza on the following Tuesday, January 26, 2016. A registration form for the workshop is available by clicking here. It's "big-band jazz times three" when the Mile High Jazz Band, Carson High Jazz Band, and Carson Middle School Jazz Band present the 13th annual combined concert, the Mile High-Carson High Jazz Extravaganza, on Tuesday, January 26, 2016, 7:00 p.m., in the Bob Boldrick Theater at the Carson City Community Center, 851 E. William Street, Carson City. The Extravaganza is sponsored by the Mile High Jazz Band Association and the Carson City Band Association as a benefit for Carson School instrumental music programs. This year, funds will help send students to the "Music in the Parks" Festival in Vallejo, Calif., in May. Tickets prices are $10 general admission and free for youth age 18 and under. Tickets can be purchased in advance from Carson High and Carson Middle School music students, at the Carson City Visitors Bureau (716 N. Carson Street), online at MileHighJazz.com, or at the door. For information, call the Mile High Jazz Band at 775-883-4154. The Extravaganza will feature three big bands, vocalist Cindee LeVal, combo performances, and the traditional grand finale combining the forces of all the musicians. Refreshments and raffle prizes will be on sale in the lobby. "We're so happy to perform with the high school and middle school jazz bands again," said David Bugli, Mile High Jazz Band leader and pianist. "The student music ensembles are great, and they deserve community support." The Carson High Jazz Band attends and competes at jazz festivals each year and has performed at community events throughout Carson City. Directed by Bill Zabelsky, the band is a zero-hour class at Carson High School designed to teach students about jazz - the music that began in America and has spread throughout the world. The Carson Middle School Jazz Band is directed by Nick Jacques, who also plays tenor sax in Mile High Jazz Band. The Mile High Jazz Band, a professional big-band, plays regularly in northern Nevada, including monthly performances and quarterly Jazz and Poetry events at Comma Coffee. They present the annual Jazz & Beyond: Carson City Music Festival in August. Photo: Combined big bands performing in the 2015 Jazz Extravaganza. Treat your Valentine to a Jazz Sampler for Sweethearts, an evening of sweet and hot big-band music at Comma Coffee on Tuesday, February 9, 2016, 7:30 to 9:00 p.m. Comma Coffee, 312 S. Carson Street, is across the street from the state legislature building in Carson City. General admission is $5 at the door; free for age 18 and under. Jazz Sampler for Sweethearts features the 19-member Mile High Jazz Band presenting jazzy versions of favorite love songs for Valentine's Day, and other swinging, big-band selections. Some highlight tunes of the evening will be "The Heat's On," "In the Mood," and "Besame Mucho." 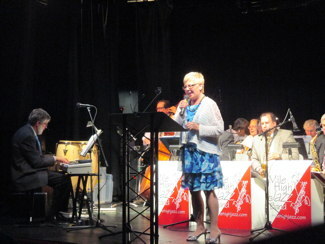 For information about the Mile High Jazz Band, call 775-883-4154 or see milehighjazz.com. 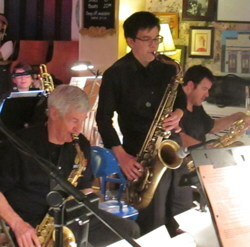 Photo: Tenor sax player, Derek Fong, with Mile High Jazz Band at Comma Coffee. The Mile High Jazz Band performs at CommaCoffee.com on Tuesday, March 8, 2016, from 7:30 to 9:30 p.m. The theme for the night is "Rituals." Joining the festivities are poets/readers Rita Geil, Joe Crowley, Krista Lukas, Tracy McQuay, Susan Sara Priest, and Timothy Rhodes. 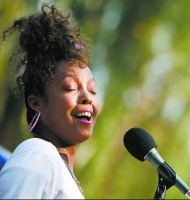 Vocalist Jakki Ford will also be featured. For 15 years, Mile High Jazz Band has been playing at CommaCoffee.com, 312 S. Carson Street, on the second Tuesday of every month. Come celebrate this milestone with us on April 12, 2016. 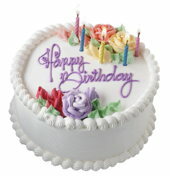 Hear sensational big-band music with vocalist Cindee LeVal, and enjoy anniversary cake at intermission. General admission is $5 at the door, and it's free for age 18 and under. The Mile High Jazz Band includes trumpets, trombones, saxophones, keyboard, guitar, bass, drums, and singers. They will play more than a dozen tunes from their ever-expanding repertoire of selections in the style of Basie, Ellington, and more contemporary composers and arrangers. The performance is supported, in part, with public funding through the Nevada Arts Council, a state agency, and the National Endowment for the Arts, a federal agency. 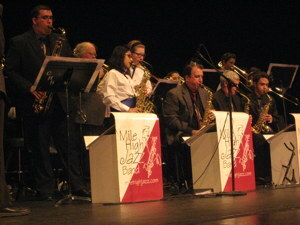 For information about the Mile High Jazz Band, call 775-883-4154, or visit their web site: MileHighJazz.com. For information about other live music at Comma Coffee, call June Joplin at 775-883-2662. The Mile High Jazz Band performs at CommaCoffee.com on Tuesday, May 10, 2016, from 7:30 to 9:00 p.m. Admission is $5 general and free for age 18 and under. Mile High Jazz Band Association, in cooperation with Carson Middle School presents a one-week Jazz Camp with sessions for middle- and high-school musicians, June 6-10, 2016, in the band room at Carson Middle School, 1140 W. King St. in Carson City. Beginning and advanced sessions are open to students from Carson City and surrounding areas in northern Nevada and California. The introductory Jazz Explorers Camp, from 9:00 to 10:15 a.m. each day, is for middle-school students who want a sample of what playing jazz music is all about. It includes learning improvisation skills, rock, Latin, and swing styles. The registration fee includes music, instruction, and snacks. The Jazz Ensemble Camp, from 10:30 a.m. to 12:00 p.m. each day, is for experienced middle-school and high-school musicians, including graduated seniors. Students will prepare pieces that cover rock, Latin, and swing styles. Registration fee includes music, instruction, snacks, t-shirt, and a performance with the Mile High Jazz Band on Tuesday, June 14, at 7:00 p.m. at the Brewery Arts Center Performance Hall. Organizer-director is Nick Jacques, instrumental music director at Carson Middle School, with guest instructors from the Mile High Jazz Band. Advance registration is required. Students can register online at www.cmsbands.org. Students may register for one or both sessions. The fee for Jazz Explorers is $20 for the week; for Jazz Ensemble is $30; and for both is $40. Payment by cash or check payable to "MHJB" is due the first day of camp. Some scholarships will be available. For more information, contact Nick Jacques at 775-283-2867 or njacques@carson.k12.nv.us. 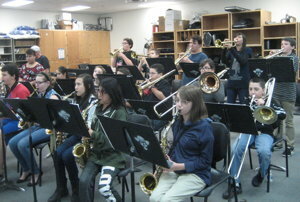 Mile High Summer Jazz Camp is supported in part by a grant from Soroptimist International of Carson City. 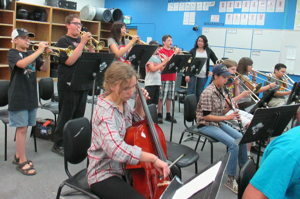 Attached Photo: Middle- and high-school musicians at Mile High Jazz Camp last summer. The "50th Jazz and Poetry: A Tribute to Bill Cowee (1942-2009)" with the Mile High Jazz Band will be presented on Tuesday, June 14, 2016, from 7:00 to 10:00 p.m. in the Performance Hall at the Brewery Arts Center, 511 W. King Street in Carson City. Acclaimed Nevada poet Bill Cowee inspired, and was the first poet to participate in, JAZZ and POETRY – first performed in 2003 at the Brewery Arts Center (and subsequently at Comma Coffee) and now a staple quarterly event. Doors open at 6:30 p.m., and the program begins at 7:00 p.m. with music by middle- and high-school students fresh from the MHJB Summer Jazz Camp (June 6 through 10). Tickets at $10 (free for age 18 and under) are available at Carson City Visitors Bureau, 716 N. Carson Street; online at MileHighJazz.com; and at the door. Admission includes a no-host bar; a live nineteen-piece big band with jazz vocalists Cindee LeVal, Jakki Ford, and June Joplin; readings by award-winning poets; autographed-book sales of their work; a souvenir memorial program; anniversary cake; and a chapbook with selections from Bill's poetry (not available in his published book). 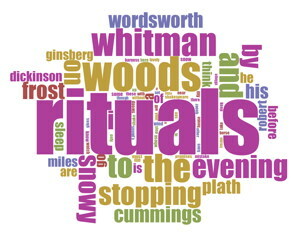 A video recording of the event (available for later purchase) will be produced, for air on local cable and for donation to libraries, especially Western Nevada College Library, which houses Bill's donation (in 2007) of more than 1,200 volumes of poetry, most featuring Northern Nevada writers. Event coordinator, poet Rita Geil, said, "This celebration will be a historic occasion. As colleague Shaun Griffin wrote, Bill's collection of poetry – Bones Set Against the Drift (Black Rock Press, 1997) – 'rang true to this landscape and the people who make the Great Basin home.' And many successful Nevada poets credit Bill's mentoring as an important influence in their literary achievements." 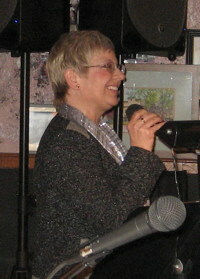 Cowee co-founded (1987) and was a guiding force of the Ash Canyon Poets, a group that continues meeting to this day. 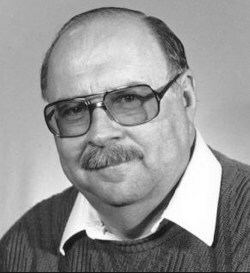 Published in over 150 journals and anthologies, in nearly all 50 states plus England, Ireland, Scotland, and Wales, Bill was honored in 2001 with a Governor's Arts Award and twice received the Nevada Arts Council Fellowship for his poetry (1997 and 2009). On this tribute evening his work will be read by award-winning poets who studied with or who were inspired by Bill, and/or who have been featured poets/readers at JAZZ AND POETRY events through the years, among them Ellen Hopkins, Shaun Griffin, Rita Geil, Joe Crowley, Susan Sara Priest, Krista Lukas, Teresa Breeden, Tracy McQuay, Anne MacQuarie, and Reno's Poet Laureate, Gailmarie Pahmeier. This event is sponsored by Mile High Jazz Band Association, the Brewery Arts Center, and Nevada Arts Council. For more information, see MileHighJazz.com or call 775-883-4154. The meal is a potluck - please bring a side dish or dessert to share. Main dish and beverages will be provided. Musicians are invited to bring instruments for possible jam session. The Mile High Jazz Band performs July Jazz at CommaCoffee.com on Tuesday, July 12, 2016, from 7:30 to 9:00 p.m. If the weather is good, we will play outdoors in Comma Courtyard. Cindee LeVal will be featured on vocal solos with the band. Pictured: Cindee LeVal singing with MHJB. The 2016 "Jazz and Beyond: Carson City Music Festival" runs from Aug. 5 to 21 at multiple locations in Carson City. Jazz & Beyond is a homegrown event that celebrates the talent of our region and relies on many local citizens who donate their time and effort. Volunteers, sponsors, and advertisers help us make the event one of the best in the area, and keep most performances admission free. The festival, which began in 2004, is presented by Mile High Jazz Band Association, Carson City, local businesses, and music lovers. Most festival events will be downtown. This year the Jazz & Beyond Festival features over 60 performances and over 100 performers. Beyond jazz, it included bluegrass, blues, rock, and more. Free events, including Sunday afternoon concerts on the grounds of the Legislature, attract large crowds. For information about festival details, volunteer positions, sponsorships, ad rates, and other details, see JazzCarsonCity.com or call the Mile High Jazz Band Association at 775-883-4154. For a printable schedule in PDF format, click here. The 2016 Jazz & Beyond festival is almost here! Once again we will have favorite bands from previous years, some great new ones, and various special events - including a day at the Silver Saddle Ranch on Aug. 7 to help celebrate the 20th anniversary of the Quality of Life Initiative. The opening event at the Bliss Mansion garden on Friday, August 5, includes a Capital City Arts Initiative and Nevada Artists Association art show and sale on the porch of the mansion, tours of the mansion, music by the Triple Treble flute trio, followed by "Cherie and John Shipley with Take This." The Ms. Dixie Vintage art bus from Fallon and a food truck will also be on hand. We'll have two Saturday afternoon performances sponsored by Carson Mall, four Sunday performances at the Legislative Plaza/Capitol Amphitheater, a lecture with live band and art show at the Brewery Arts Center, a fabulous Speakeasy Swing Dance Party, and lots more. For detailed information, see http://jazzcarsoncity.com. For a printable schedule in PDF format, click here. The Mile High Jazz Band performs July Jazz at CommaCoffee.com on Tuesday, July 12, 2016, from 7:30 to 9:30 p.m. If the weather is good, we will play outdoors in Comma Courtyard. 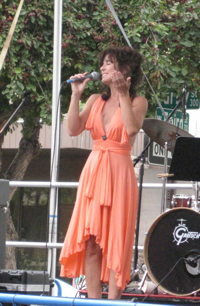 This is during the Jazz & Beyond Carson City Music Festival. Cindee LeVal, Jakki Ford, and June Joplin will be featured on vocal solos with the band. Pictured: June Joplin singing with MHJB. As part of the "Jazz & Beyond Music Festival," the Millennium Bugs will play from 6:00 to 8:00 p.m. at the Foreman-Roberts House Museum on Saturday, Aug. 13, 2016, for the Carson City Historical Society Ice Cream Social. The event is free. Ice cream may be purchased at the event. Mile High Jazz Band Presents "Falling"
The Mile High Jazz Band with vocalist Cindee LeVal will be joined by several poets and readers on Tuesday, September 13, 2016, 7:30-9:30 p.m., for an evening of big-band music and poetry on the theme "Falling." Each poem will be followed by a related big-band tune. The event will be at Comma Coffee, 312 S. Carson Street, across the street from the state legislature building in Carson City, outdoors in the adjacent courtyard, weather permitting. Admission is $5 general and free for age 18 and under. The program will feature poets and readers Rita Geil, David Bugli, Tracy McQuay, Susan Sara Priest, Timothy Rhodes, and Amy Roby. Poems will explore the arrival of autumn, sharing a plane ride with a cat, meteor showers, windfalls under apple trees, other subjects, and - of course - falling in love. For more information, call the Mile High Jazz Band at 775-883-4154, or visit the web site: MileHighJazz.com. 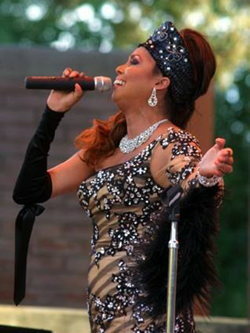 Photo: Cindee LeVal will sing with the Mile High Jazz Band on September 13. She is shown here in the Brewery Arts Center Performance Hall performing at our tribute to poet Bill Cowee. Enjoy an evening of big-band music with vocalist Jakki Ford at Comma Coffee on Tuesday, October 11, 2016, from 7:30 to 9:30 p.m. Comma Coffee, 312 S. Carson Street, is across the street from the state legislature building in Carson City. General admission is $5 at the door; free for age 18 and under. The program, Autumn Jazz, presents the 17-member Mile High Jazz Band playing favorite and new big-band songs. Some highlight tunes of the evening will be "A Night in Tunisia," featuring trumpeter Wayne Theriault, and "Basically Blues," originally written for the Buddy Rich band. Jakki Ford will sing "That Old Black Magic," "The Nearness of You," and other great tunes. Autumn Jazz is part of World Music Days, an annual global event affirming the ideals of tolerance, friendship, and shared humanity, inspired by the life and work of journalist and musician Daniel Pearl. The performance also commemorates National Arts and Humanities month, a coast-to-coast recognition of the importance of culture in America. 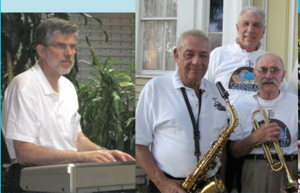 For information about Autumn Jazz and the Mile High Jazz Band Band, call 775-883-4154, or see the website MileHighJazz.com. For information on other events at Comma Coffee, call June Joplin at 775-883-2662 or see the website CommaCoffee.com. Pictured: Vocalist Jakki Ford will perform with Mile High Jazz Band at Comma Coffee, October 11. Come out on Election Night for an evening of big-band music with vocalist Jakki Ford at CommaCoffee.com on Tuesday, November 8, 2016, from 7:30 to 9:30 p.m. Comma Coffee, 312 S. Carson Street, is across the street from the state legislature building in Carson City. General admission is $5 at the door; free for age 18 and under. "The polls will be closed, choices made. Whatever the outcome, don't sit at home," says pianist David Bugli. "Enjoy Election Night Jazz with the 17-member Mile High Jazz Band. We'll play favorite and new big-band songs. Exercise your right to have a good time!!" Some highlight tunes of the evening will be "Speak No Evil," "Day by Day," and "American Patrol." 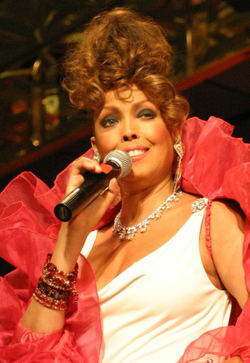 Jakki Ford will sing several tunes, including "All or Nothing at All" and "A Day in the Life of a Fool." Mile High Jazz Band events are supported in part by a grant from the Nevada Arts Council and the National Endowment for the Arts. For information about Election Night Jazz and the Mile High Jazz Band, call 775-883-4154, or see the website MileHighJazz.com. For information on other events at Comma Coffee, call June Joplin at 775-883-2662 or see the website CommaCoffee.com. Pictured: Vocalist Jakki Ford will perform with Mile High Jazz Band at Comma Coffee on Election Night. The Mile High Jazz Band performs "Jazz & Poetry" at CommaCoffee.com on Tuesday, Dec. 13, 2016, from 7:30 to 9:30 p.m. The theme for the night is "'Twas the Night." Joining the band on the concert will be several poet-readers, selected by MHJB's "poet wrangler" Rita Geil, reading some of their favorite poems related, in some manner, to the theme. Jakki Ford and Comma Coffee owner June Joplin will be singing some great songs with the band, some of them related to the holiday season. Comma Coffee, 312 S. Carson Street, is across the street from the state legislature building in Carson City. General admission is $5 at the door; free for age 18 and under. Pictured: Vocalists Jakki Ford and June Joplin will perform with Mile High Jazz Band at Comma Coffee during Jazz & Poetry event.